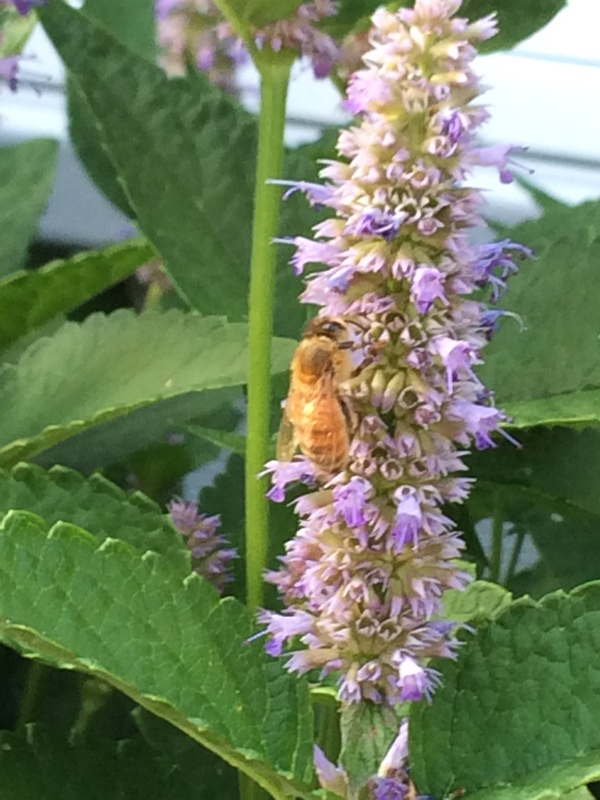 Bees swarm anise hyssop from the minute it blooms each summer. Anise hyssop (Agastache foeniculum) is the biggest bee magnet in my yard. Sometimes called giant anise hyssop or hummingbird mint, I can attest to both its size and its lovely scent. I have three of these planted below the window in my garage that faces the back garden. (Check out the photo of the giant trio at the end of this post.) The plants are currently above the garage window sill and covered the blooms. One caveat: They do seed rather freely — like crazy freely! Fortunately, the seedlings are very easy to identify by their appearance and scent and are quick to pull. Blazing star (LIatris spp.) is a plant both butterflies and bees love. In my Northfield garden, I had ‘Kobold’ liatris in the front garden. This plant has a lovely bottle-brush flower and was a favorite with many butterflies as well as bees. Maintenance could not have been easier. Once it was established, I cut back the old flowers in spring. That’s it. Nothing more. Rarely watered and never fertilized it. For my new back garden, I planted meadow blazing star (L. ligulistylis) on recommendation from pollinator expert Rhonda Fleming Hayes. 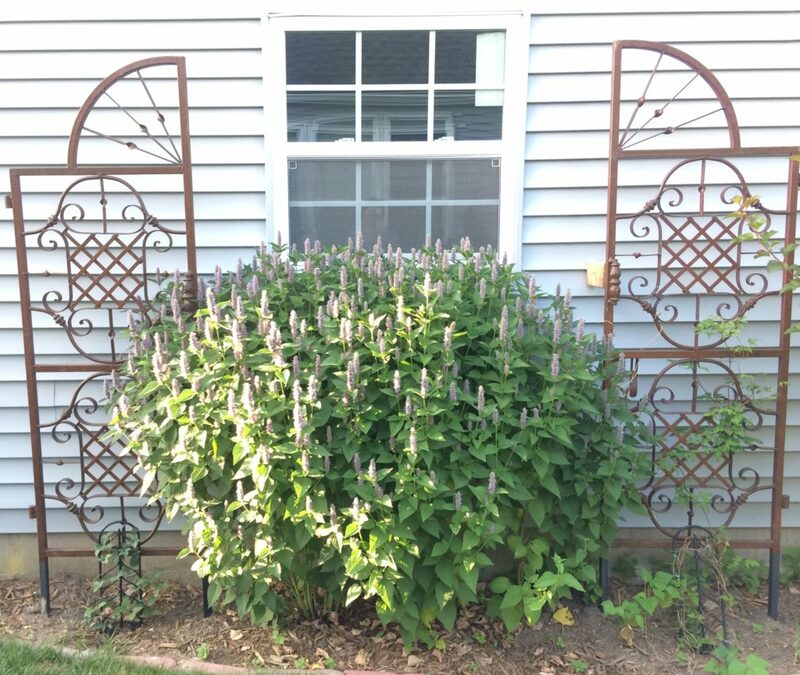 It’s in its first year in the garden, so it has not gotten as tall as advertised yet. I’m hoping for good things from this one! Mexican sunflower (Tithonia rotundifolia) is that plant you see all over Instragram with monarch butterflies on it. (Check out my feed to see one.) 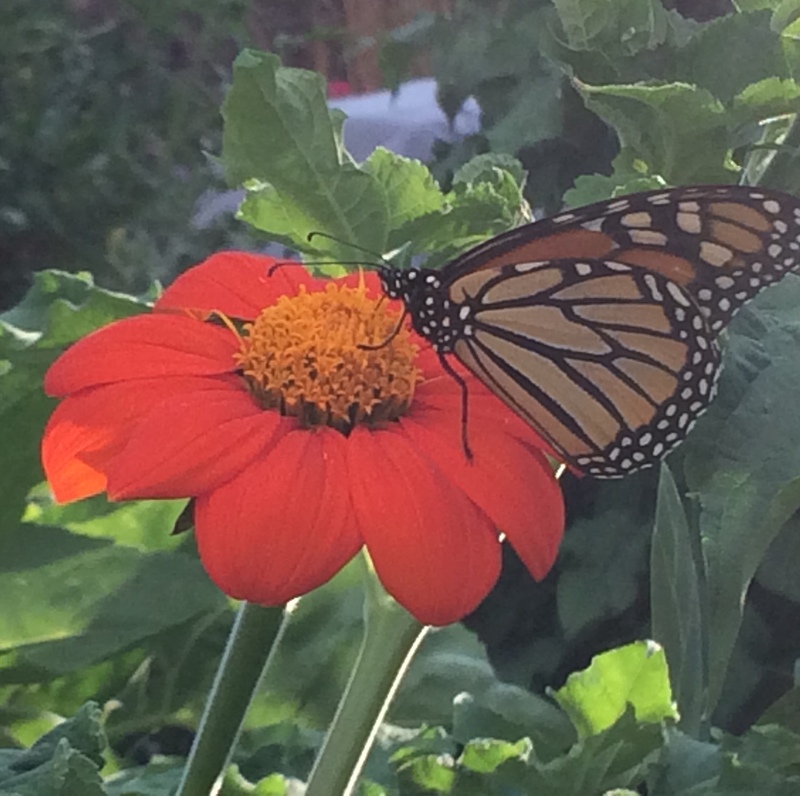 After milkweed, which is the only plant monarch’s lay eggs on, Mexican sunflower is probably the most popular plant with monarchs that I have ever planted. Once the blooms start doing their bright orange thing, the monarchs are there. Bees also love it. The plant itself is large—4 to 5 feet tall—and the foliage is big and not exactly pretty, but the flowers, the flowers, the flowers. For them and the monarchs, I plant this one. Three giant hyssop plants easily fill the space below my garage window. « Why Grow Tomatoes in Containers? Nice article. The bees are all over the bee balm, and the oregano in my little garden. Another fav is the russian sage. I planted pollinators for hummingbirds. They seem to like the hummingbird feeders. I wish I could get a few of your giant anise hyssop. I put in a couple of blazing stars and they were about to bloom when the rabbits bit off the bloom. Oh yes, these are all awesome! I haven’t had much luck with Anise Hyssop in dappled shade, but I planted it in a pollinator garden elsewhere and it loves the sun. I agree: It smells amazing! 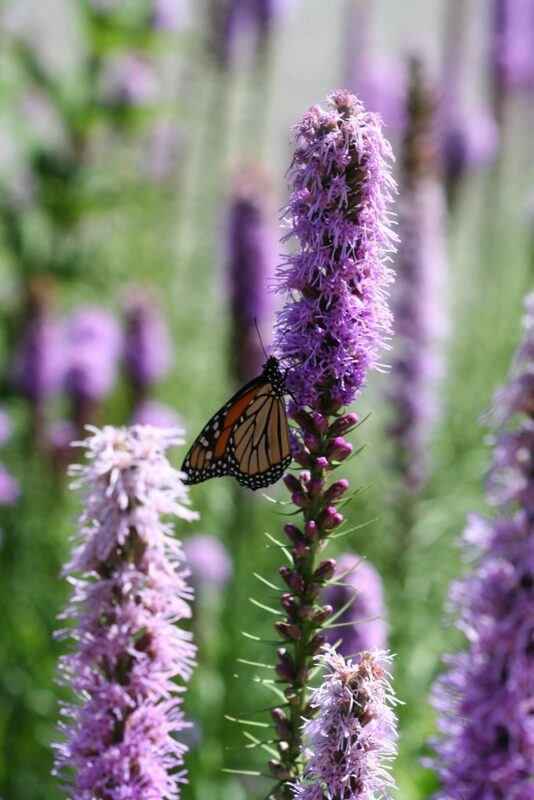 I’ve had Liatris for many, many years–definitely easy, beautiful, and beneficial for the pollinators. I’m new to Mexican Sunflowers, but I’m very pleased with the results this year. They are beautiful!